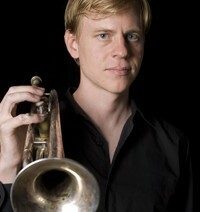 Dan Blankinship is a soulful and versatile trumpet player, composer, and educator. Born and raised in Richmond, VA, he started playing the trumpet at age 11. Over the next several years he was selected for numerous regional and state-wide honor bands, leading him attend the Interlochen Arts Camp and Boston University Tanglewood Institute summer programs while in high school. Dan continued his musical education at the Peabody Conservatory in Baltimore, where he stayed for two years immersed in classical music. At this point Dan decided to abandon a ‘legit’ musical career and took a two-year break from school to join the funk band Jay Jay. In 1999 he then moved to NYC to attend the New School for Jazz and Contemporary Music, where he completed his BFA. His next stop on the formal education circuit was to earn an MA from the Queens College Aaron Copland School of Music. Dan is a proud member of The Flail, a cooperative jazz quintet that has been playing and composing together since 2001; they have released three albums, toured France several times, and regularly perform such venues as Blues Alley, Smalls, Chris’ Jazz Cafe, and Fat Cat. He also freelances with small combos and big bands in styles ranging from modern to traditional jazz and son cubano to salsa. Some of these groups are the Fat Cat Big Band, Tip Top, Harbor Conservatory Latin Big Band, Lapis Luna, Ray Rivera con Sabor Latino, Conjunto Guantanamo, and the Blue Vipers of Brooklyn. He has shared the stage with the likes of Wynton Marsalis, Jon Faddis, Candido, Lenny Pickett, Johnny Griffin, Junior Mance, George Garzone, Jose Madera, Curtis Fuller, Ray Santos, Cyro Baptista, and Eek-A-Mouse. In addition to his private studio, Dan has been a teacher for Education Through Music, Bronx Lab School, Bronx Charter School for the Arts, and the Litchfield Jazz Festival Summer Music School. For more about Dan, visit www.TheFlail.com.